Use fresh fennel leaves in salads or with eggs, fish and sauces. The bulbous stem can be steamed, grilled or served raw; it's like celery with a delicate anise aroma. Chopped and sauteed, it's great with shrimp. Likes full sun and mild to cool weather. Start outside after danger of frost. 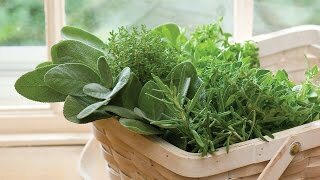 Grow the freshest herbs for dishes and seasonings right on your deck, porch or patio! Sow outdoors in spring after the last frost. In frost free areas sow from fall to early spring. Sow in average soil in full sun. Carefully remove the plant from its pot and gently loosen the root ball, if tight, with your hands to encourage good root development. Do not allow plants to dry out, but never let the soil stay wet. Thin 10 inches apart when seedlings are 1-2 inches high. As a tender perennial, sweet fennel is short-lived but will reseed abundantly. Enjoy the young leaves as a garnish and flavoring for soups, salads, and fish. Bulbous stems may be roasted, grilled or served raw. Stalks may be used as a celery substitute or used to make broths. Use the tasty seeds crushed or whole in sausage and other meats, as well as to make a refreshing tea with a warm, sweet anise flavor. Fennel’s lacy texture makes it a valuable garden plant and it is also a favorite of black swallowtail butterfly caterpillars. Fennel may be stored fresh in a plastic bag in the crisper drawer in the fridge for a few days. Separate the stalks from the bulbs and store separately. Fennel bulbs may also be frozen after blanching for three minutes. Leaves may be dried, but lose flavor when dried. Stalks may be dried, but remove the leaves first. Fennel, Florence is rated 4.5 out of 5 by 2. Rated 4 out of 5 by NewTexan from Good fennel seeds Bought 2 bags, all planted. I would say 90% growed out. Now they are 5" tall. Good product. Take one star off it's because the price is more than other Burpee seeds that can be found at local home depot. Rated 5 out of 5 by sunnysally from Fennel as I remember it Wonder anise flavor...but if you mound them in slight patted mounds, they bulb better and aren't so flat. Thicker flesh too!